Few places on this planet feel like a true wooded dreamland. Yet, in the forgotten Northwest corner of Washington State, such an area exists. With its towering trees, drooping moss, and fern-laden gullies, the Hoh Rain Forest of Olympic National Park gives access to a beautiful and silent forest within 169 miles of the bustling downtown of Seattle, making the Hoh a great place for a day trip, or better yet, a fantastic and magical multi-day camping destination. 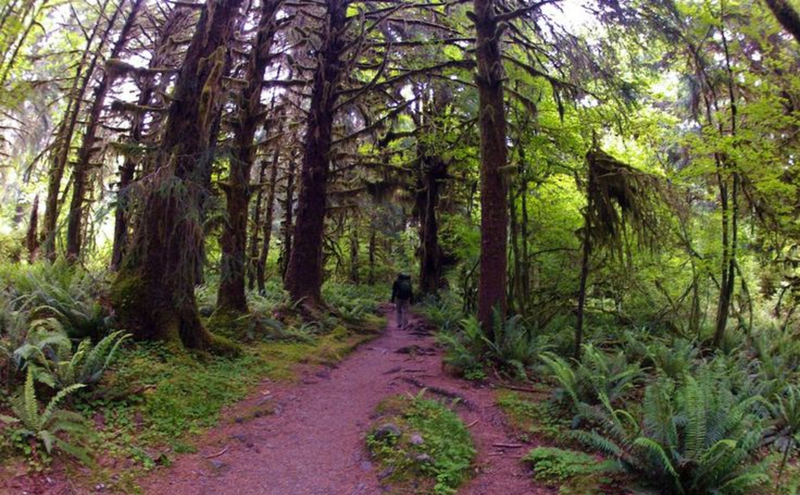 This Olympic oasis is the most-famous temperate rain forest in America and for good reason. As salmon swim next to the trail in the milky-blue Hoh River, elk are commonly seen and heard wandering around the huge cedar, fir, and maple trees. Rare sightings of black bear and bobcat have been reported, but the draw to Olympic’s Hoh region isn’t just about the animals; it is about the silence, the trees and of course, the amazingly scenic hikes. There is one somewhat simple hike a few miles upriver from the visitor center that takes you to where the quietest square inch in America sits. You can sit in silence, surrounded by some of the wildest and wettest terrain in the world, any time throughout the year. What makes the Hoh rain forest so spectacular is that, as remote as it feels, the road to the parking lot and visitor center is paved, which is an anomaly for areas that possess this level of beauty. Exploring the Hoh is easy, as the trails are mostly flat and incredibly easy to navigate. 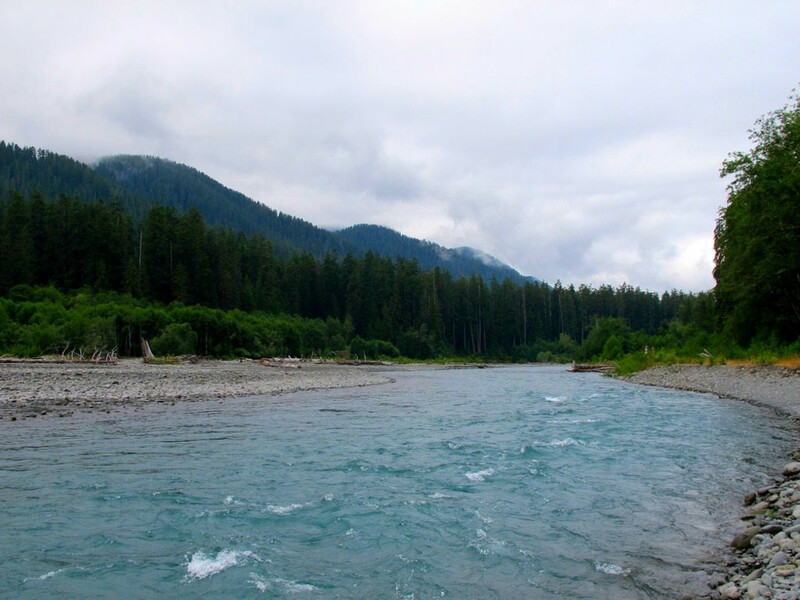 With three hiking options , ranging from easy to standing on top of the glaciers of Mount Olympus, hiking along the Hoh River is exactly what you are looking for in a rain forest trail. Starting at the visitor center, the Hall of Mosses trail is the natural starting point for exploring. At eight-tenths of a mile, and 500 feet of elevation gain, the Hall of Mosses offers numerous highlights. 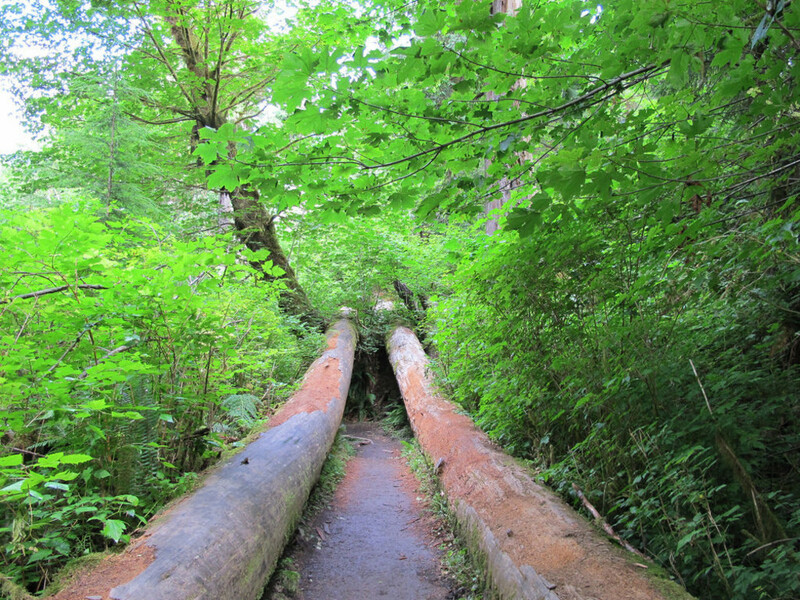 From the maple grove that has trees weighted down by hundreds of pounds of moss, to fallen giants giving life to future generations of rain forest, this short trail is perfect for starting your exploration of the rain forests of Olympic National Park. If less than a mile of hiking seems a bit too easy, add a trek around the Spruce Nature Trail, which can be added to the Hall of Mosses hike or started from the visitor center. 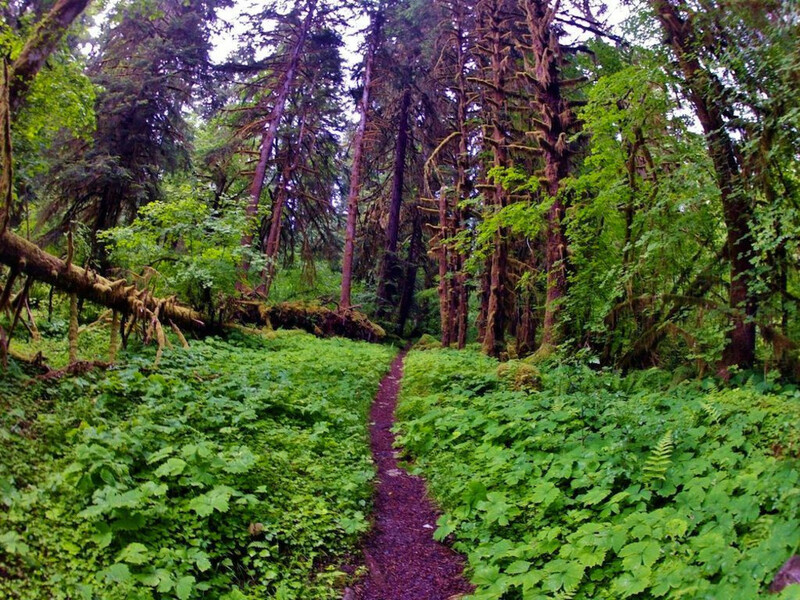 At 1.25 miles, this loop trail provides even more unique rainforest beauty, with small creeks surrounded by mossy trees and ferns, as well as a chance to stand on the banks of the mighty Hoh River. During the fall months, this trail provides excellent opportunities to see eagles, salmon, and elk, as well as a forest floor covered with colorful mushrooms. 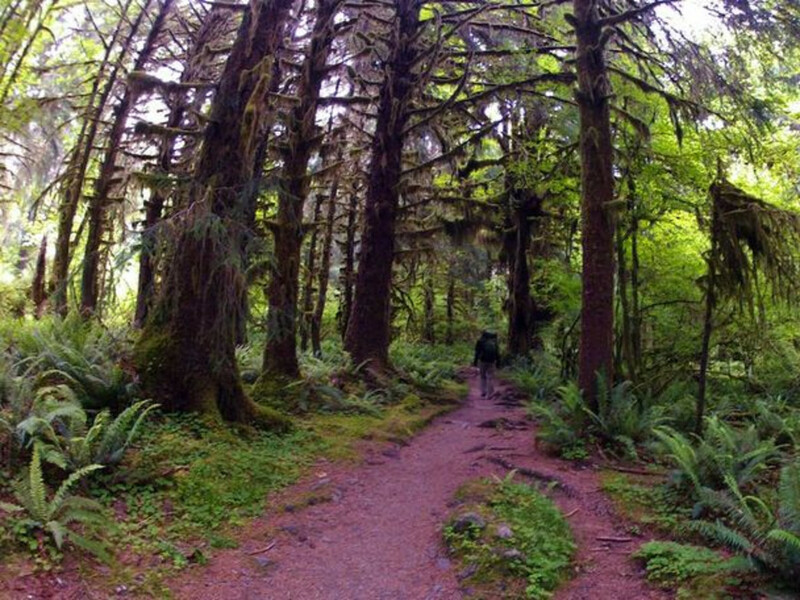 For those looking for the greatest experience in this rain forest, add a 5-mile adventure up the Hoh River to 5 Mile Island. The trail is mostly flat but is lined with giant cedars, firs and maples, offering views of snowy mountains. Capped off with creek crossings on small wooden bridges, the hikes along the river are indescribably beautiful. The Hoh River trail is also a great first-time backpacking trip, leading all the way up to the 7,979 foot summit of Mount Olympus. Complete with a backcountry ranger station, an incredible bridge called the 'High Hoh Bridge', and access to a few wonderful alpine lakes, hiking in the Hoh gives some of the best experiences one can have in not just the Pacific Northwest, but in the world. 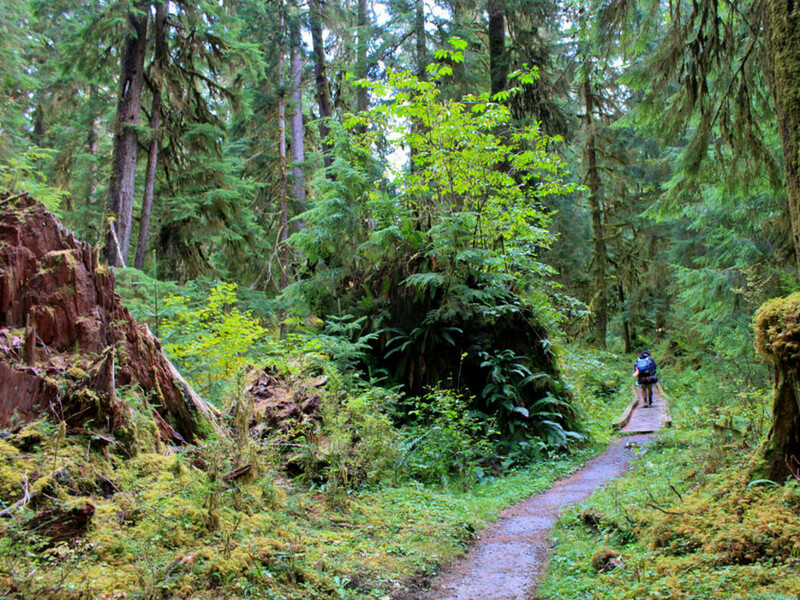 Year round, the Hoh Rainforest is accessible. Weather-wise, expect rain, though the summer months are a little drier than people think. Get good rain gear from Seattle-based Outdoor Research and you will stay dry no matter what the wild, wet weather of Olympic National Park will throw at you. The Hoh Rain Forest is worth the drive, letting you step back into a timeless land of beauty, wonder, and adventure. What are you waiting for?